A senior civil servant has been fined after pleading guilty to leaving top secret documents on a train. Richard Jackson admitted negligence by losing the files on a service from London Waterloo to Surrey on 10 June. City of Westminster Magistrates Court heard the documents "had the potential to damage national security and UK international relations". Cabinet Office official Jackson, 37, of Yateley, Hampshire, was fined £2,500 and will have to pay £250 costs. The lost documents were passed to BBC security correspondent Frank Gardner by a member of the public. One of the files was marked top secret and the other was mid-level security, the court heard. The court was told that Jackson, who had taken the documents home by accident, was "physically sick" when he found they had gone missing. 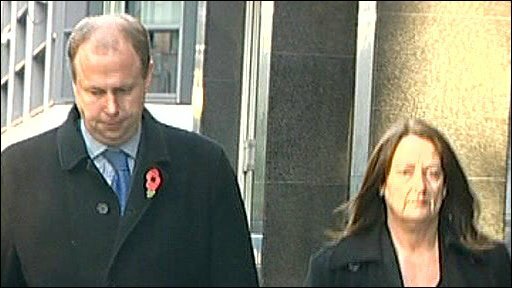 Neil Saunders, defending, said his client accepted his mistake but "there was never any risk to any lives whatsoever". Mr Saunders said: "He was under extreme pressure at this time and it may well be partly because of his own role, the team he was leading and the work he was being asked to conduct that he has made this gross error of judgment." Prosecutor Deborah Walsh said his delay in reporting the files as lost until the following day - his immediate bosses were abroad - put back any attempts to recover them. She said: "There's ample evidence that Mr Jackson failed to take such care to prevent the unauthorised disclosure of the documents as somebody in his position may reasonably be expected to take." Jackson had been charged under clause 8.1 of the Official Secrets Act, which deals with safeguarding information.